The Transition of humanity into the next cycle of life to another level of the material world, as well as the causes and events that will force mankind to make it – is the main leitmotif of Nostradamus’ drawings-pictograms. 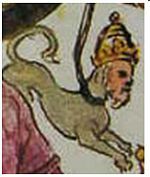 The main image of the fourth part of the decoded pictures of Nostradamus – is a Lion. In the Wheel of Time a Lion unwittingly pays attention by the unusual pose – with head upside down. 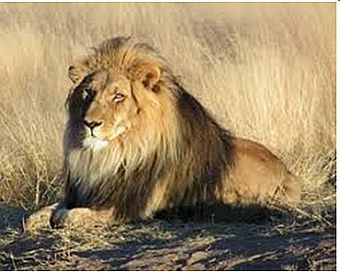 The image of the Lion transmits to humanity extremely important information about the Transition. On the one hand, the incredible power of the Lion - the king of beasts, in the drawings of Nostradamus depicts incredible strengthening of weak action of the united consciousness of humanity, which it should create for the occurrence of the laser beam and the destruction of the body at the level of the Crystal structures. This strengthening can be realized only through homogeneous-resonant structure of human consciousness. It should be created, and it is here that there arises an overwhelming obstacle ... Rather it is avoidable, but if it is known in advance. However, mankind does not even guess that it exists within each of us! This obstacle represents wide and rigid boundaries of our cells due to the carbon basis of our life. At unification of consciousness areas of brain of our cells only just touch each other, but they have to be superimposed for information exchange. And then, the action of the united consciousness of humanity will be much stronger than it is today, than today we can create. This obstacle will not allow us to create a uniform resonant structure of consciousness, because will not allow to merge all areas of the brain under unification of consciousness. This obstacle is so deadly dangerous for the Transition, that apostle Peter made the decision to be crucified with head upside down. Thus, he warned that for the Transition humanity has to overturn consciousness from hate for love according to the golden rule of morality – Love your neighbor as yourself. Revolution of consciousness for the Transition - this is just the other side of the image of the Lion represented in drawings of Nostradamus. The part about the creation of the laser beam for the Transition in the Instructions, received from the Above, on the eve of beginning of cataclysms, is as follows. For the Transition to mankind from the Above is suggested the following scheme of the work. To create and amplify the laser beam have to be two groups of people - the righteous and the whole of humanity. The righteous are the people of higher consciousness, who have dedicated their lives to prayer, have the powerful action. They have to create a separate laser beams. However, the number of people on the planet is not enough to create a very powerful laser beam to destroy the bodies of all civilization, as well as the three previous levels of consciousness, which are included in an individual cell of each human. Humanity, having created a homogeneous-resonant structure of the united consciousness has to incredibly amplify these individual laser rays and transform them into a single laser beam of enormous power. This incredible amplifying of uniformly-resonant medium which have to create mankind, and depicts the image of the Lion in the drawings of Nostradamus. The laser beam is shown by the edge of the sword. Synchronization of consciousness. It is important to note that before the creation of homogeneous-resonant structure of the unified consciousness it is necessary to synchronize consciousness of humanity. Synchronization is created by a special system of breathing, one of which is represented in the school «The Art of living». The pictures are easy to read with the «Dictionary of the symbols of consciousness», composed by the authors. Let's decode these pictures in details. Summary. At the highest point of the Wheel of Time are set hourglass. The Black Rooster of Armageddon, ready to take off, keeps track of time. It is prepared for the moment when the Wheel of Time will be stopped. Black and red colors, i.e. of the mourning of the coloring of the Rooster means that for humanity will begin severe time associated with deep mourning of huge loss. The reason for the onset of this time is shown on the opposite side of the diameter of the Wheel by the Green Serpent, which lies on the Indian's neck with red feathers and pressed to the Wheel of Time with his hands. In the symbolism of consciousness the image of the snake means cataclysm. Notified in advance of the occurrence of global cataclysms mankind have to make the Transition in time – before the beginning of the second pre-cataclysm. This Transition depicts the Peacock, which connects, by enormous swing of the paws, the image of the Snake-cataclysm with the clock, where his sensitive paw lies. This shows that humanity has to carefully and very closely watch the developing events not to miss that precious short period of time, during which it has to make the Transition to the safe Highest level of the material world. This information transmits closed circuit of related between each other images. The Man is holding the tail of the Big Lion the great amplifier of the uniform-resonant structure of human consciousness. Big Lion, in turn, holds in its paws leash of the Little Lion, depicting the increased action of the united consciousness of humanity that can cause the laser beam, which is shown by the Sword. The jump of the Little Lion on the Sword, informs that mankind has fully complied all the Instructions and invokes the action of the united consciousness of extraordinary power in the form of a laser beam that can destroy our bodies for the General resurrection and the beginning of the new cycle of life at the Highest level of the material world. This circuit of images is located directly behind the Black Rooster of Armageddon. So is shown a crucial stage of preparation for the Transition. Nostradamus informs that all the counteraction to the Transition of some powers that be, the Kings and Rulers will be removed from the Above, until the complete deprivation of their power. The Transition that provides continuation of life of mankind has to be held under any circumstances and in time. The Wheel of Events is stopped from the Above that means the Transition. The Wheel of Events is stopped from the Above that means the Transition. On the picture is shown the Wheel of Events of humanity on the background of usual life – it is mountains and valleys, trees and grass, clouds, houses and castles. This Wheel would rotate forever and generation will replace the generation. It is just this chain of events observe the fortune tellers, revealing them for centuries to come. However… the rotation of the Wheel of Events is controlled from the Above. This is indicated by the Hand, in which is clamped long iron rod connected with the Wheel’ axle, forming a rigid mechanism of steering of the Wheel of Events. Location of the elements of control mechanism shows that at the given moment the Hand stops the Wheel of Events. This means that the level of consciousness of humanity in this cycle has reached its maximum, and in order to continue its improvement humanity has to make the Transition into the next cycle of life. The development of human consciousness happens by cycles and after the cycle of Consciousness will come the cycle of Corrections, in which consciousness will be forcibly perfected in accordance with the laws of the universe, known as the commandments. This cycle with completely different conditions of life will take place at the Highest level of the material world. In the next cycle will be only two categories – paradise and hell, and everyone will be responsible for its actions made today in the cycle of Consciousness. Slightly protruding collars on Hand is presented in form of a crescent, as well as the oval of dematerialization and the Transition. These symbols once again emphasize the necessity of the Transition to the next cycle of life due to the end of the cycle of Consciousness. A hand sticks out of the circle formed by four golden crescents of the united consciousness. So is shown a cell of the united consciousness of humanity. This says that the Transition is to the next cycle of life possible only simultaneously for all of humanity, but individually, one by one the Transition can not be made. The golden color shows that it is information from the Above. Thus, at some point in time the usual course of human life on earth changes and due to the start of the mechanism of global cataclysms beginning of the planet' destruction. This end of this cycle of Consciousness has been known for a long time and presented for mankind in the form of the end of the Mayan calendar. The calendar was not made of ears of wheat in the fields, as some temporary pictograms of crop circles, but was made of stone to preserve forever, that he waited for the time when it becomes known to mankind. Thus, civilization was warned beforehand that just on 21 December 2012 consciousness of humanity will reach the maximum, and the cycle in harmony of the Earth will be over. This is the beginning of the boundary of the mechanisms of destruction of the planet, which will force mankind to leave the territory of a life-threatening level of the Crystal structures. At the end of the cycle of consciousness the level of consciousness of mankind reaches its maximum, and humanity has to make the Transition to the new cycle of development of consciousness – the cycle of Correction. If at this moment the Wheel of Events will not be stopped, begin to develop the pathology of consciousness. Crystal Structures, where will soon rage global cataclysms to the secure the Highest level, mankind has to make in the nearest time. Mankind will not be able to fight with cataclysms, because their goal is the complete destruction of the planet. Humanity has already received all the Instructions for the Transition, and they are presented in details in this picture. The Wheel of Events. In the center of the figure is shown the Wheel of Events. It depicts the expansion of the area of the brain of information cell as a result of unification of people's consciousness. In the centers depicted the individual cell. It shows by two circles - in the form of a small axis in the center and by large - in the form of the rim. The small circle in the center - this is an area of the brain of an individual cell, and a large circle - the border of the individual cell. On the other hand, the spokes represent the expansion of the area of the brain area as a result of combining consciousness of people. In this case, a large circle represents an area of the brain of cell of the united consciousness of civilization of Earth. The wheel consists of an axis, the eight spokes and the rim. The axis with the L-shaped pin and lever depict the management of human society from the Above. The management can be even rigid, if necessary. L-shaped pin imbedded in a small circle, which represents the brain area of an individual human cell. Diverging from a small circle the extensions that form the spokes, disclose previous levels of consciousness, which includes the individual consciousness. The picture shows that the individual human consciousness, corresponding to the fourth level includes the previous level of consciousness - the consciousness of inorganic nature of the stars and planets, as well as organic nature. However, most importantly, that individual consciousness can unite. Unified consciousness - it is the fifth the highest level. This pin is connected with rigid control mechanism of the Wheel of Events. This combination represents a fundamental change in the mode of consciousness - the individual on the united. The axis of the Wheel depicts the brain area of an individual human cell. Rim of the Wheel – is the border of the cells - of the individual and the united consciousness. Spokes – long rectangles – represent a shift of the brain areas under the association of consciousness. In the Wheel are eight spokes. Number eight indicates on eight people, or four pairs of people of the fourth level of consciousness who unified consciousness. On the other hand, the number eight represents two people of the fourth level of consciousness that have united consciousness. The segments between the spokes of the rim depict the expansion of consciousness during the transition from individual consciousness to the united of whole civilization. This extension is realized due to join the process of uniting of consciousness of more people. The Wheel consists of eight such segments. Expansion of segments informs that the process of consciousness unification continues and spreads until it covers the whole civilization of Earth. Extended area of the brain of the cell of the united consciousness of civilization shows the rim. Thus, the spokes-extensions represent the united consciousness of all civilization. 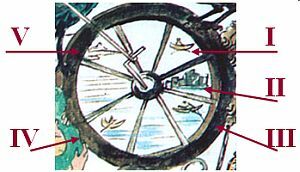 Consequently, the image of the Wheel shows the necessity to unite consciousness of humanity. The black sand-glass and the Black Rooster. From the shutdown of the Wheel for humanity begins a time of severe events. This emphasizes two elements on the top of the Wheel of the Events, painted in black – the Black sand-glass and Black Rooster – the symbol of the Trouble and Armageddon. The red color in the picture. The red color, in which are colored some elements on the picture, indicate a relationship of an object with the Information world and show that this information will be transferred to people. Thus, the cuff on the Hand, slightly leaning out, painted in red color, indicates that this Hand from the Above is connected with the Information world and manages the Wheel of the Events. By stopping the Wheel of Events, the Hand transfers the information about the Transition. Red comb and earrings of the Black Rooster mean that this moment of stop of the Wheel of the Events is already known and will happen in the exactly minute of the sand-glass. This emphasizes the paw of the Peacock – the symbol of the Transition, which rests on Black sand-glass. Red feathers on the head of the American Indian is the symbol of the Transition-flight of humanity on the Highest level of the material world in the next cycle of life. The Peacock is the symbol of the Transition and the united consciousness. Lever of operating, which stops the Wheel of the Events, is pulled through the Peacock – the bird of the Transition. The Peacock shows the way out of a seemingly hopeless situation for mankind that is completely tied to the Earth. The Peacock’ right paw rests on the Wheel of the Events, directly over the head of the Serpent-cataclysm and the left paw rests on the Black sand-glass, meaning the beginning of severe time for humanity. It informs that the Wheel of the Events is stopped, and the hour of unification of human consciousness of the Earth for the Transition to the next cycle of life has already come. The left paw of the Peacock is on the side of the heart and indicates that at the base of unification of human consciousness has to be love and mutual understanding. Peacock informs that mankind should hurry up – it is necessary to make the Transition in time before the beginning of global cataclysms. The Peacock's tail, covered by numerous repeating symbols «the crescent of the united consciousness», reminding the «eye», reveals the basis of the Transition – synchronous unification of consciousness of civilization, which will cause the simultaneous shifting of the brain area in all individual cells of humanity. Peacock symbolizes the sacred bird Phoenix. According to legend, foreseeing of his death, Phoenix sets fire to himself with his nest, and from the ashes reborn the newly renovated Phoenix, continuing the journey of life. This legend about the transformation of the Phoenix very vividly describes the process of Transition of humanity to the Highest level of the material world. Before the deadly threat of global cataclysms humanity through the united consciousness should cause the laser beam, which will destroy our bodies on the level of Crystal structures. At the same time renewed humanity will arise again on the Highest level of the material world. So will happen the General resurrection and the life of humanity will continue in the new cycle. Peacock informs humanity about the conditions of the Transition. Thus, together with the information about the beginning of global cataclysms that indicate mortal danger, humanity will receive the Instructions about the Transition, as the only way to continue living. The Green Snake is a symbol of global cataclysms and feathers of the Transition. The Green Snake, which lies on the neck of an Indian with red feathers and pressed to the Wheel of Time by his hands shows one of the pre-cataclysms. So is the transmitted information about the global cataclysms that are already stay on the road of Time and are already marked on the Wheel Events. Green color of the Snake means that this cataclysm will happen in the life of humanity. The Snake is located directly opposite the Black Rooster of Armageddon, which means the most difficult events of onset of cataclysms, and deep mourning, as a result of huge losses. The Black Rooster is waiting in the wings, ready to take off. Opposite the Black Rooster is depicted the Peacock, left paw of which is resting on an hourglass. The Peacock shows the way of humanity to the Transition into a new cycle of life and immortality through the General resurrection. The Native American Maya with a huge Snake indicates that territories of South and North America will be subjected to the blow of thes preliminary cataclysm. Indian with feathers on his head tells us that humanity as a bird should make the flight-Transition to another level of the material world. The tail of the Snake hidden in pants of Indian of blue colors is the color of water. This shows that the cataclysm will arise in the ocean. The yellow cross on pants of Indian transmits information about huge human losses in this pre-cataclysm. The Circle of the Transition. 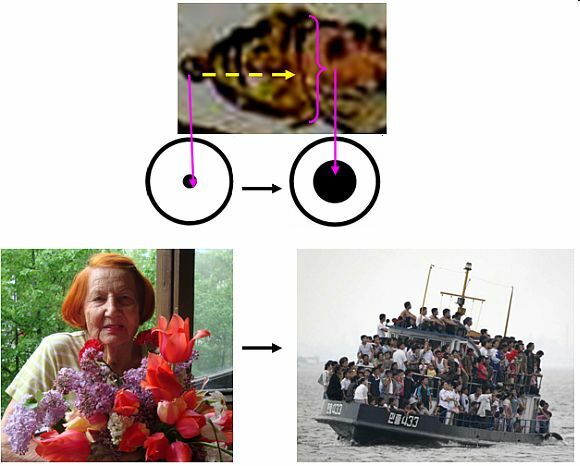 On the picture are shown several figures connected in series with one another and forming a circle. Thus, a Man in a brown dress with both hands grabbed the tail of the Big Lion. The Big Lion in front paws is holding the leash of the Little Lion with a Crown on his head. The Little Lion, in turn, makes the jump from the back of the King, who lost power and the crown, on the hilt of the Sword, which hangs on the left side of the Man in brown dress. The main purpose of this picture to warn mankind of Earth about the necessity to make the Transition to the Highest level of the material world to save life before the global cataclysms’ beginning. For the Transition it is necessary to destroy bodies at the level of the Crystal Structure. This can only make only the action of incredible strength caused by the combined consciousness of humanity in the form of a laser beam. In this process should involve two groups of people. On the one hand, it is all of humanity, which should not only synchronize the unification of consciousness, but also to create homogeneous-resonant structure. Another group – the people of higher consciousness – should cause the laser beam. This beam in a uniform and a resonant medium will be incredibly amplified and will destroy all human bodies at the level of the Crystal structure. At the same moment, universal resurrection of civilization will occur at the Highest level of the material world. This way the Earth's civilization will make the Transition to the next cycle of life. This sequence of events is shown by several different figures, gathered in a circle. Thus, the circle represents all the phases of the Transition from the merger of consciousness of civilization to the incredible power of the laser beam that destroys the body at the level of the Crystal structure. Let’s consider what means these connected in series images in the symbolic consciousness. A Man in a brown dress represents the unification of consciousness of civilization for the Transition to the Highest level of the material world. However, for the Transition to the Highest level of the parallel worlds of the material world the body has to be destroyed at the level of the Crystal structures. In order to do this, it is necessary to cause the action of the united consciousness of incredible power in the form of the laser beam. Humanity possesses very weak action of the united consciousness, and so it has to seek help from the Big Lion – the king of beasts, who has incredible power. For this purpose, the Man by two hands clutch for the tail of the Big Lion, which enhances the possibility of civilization’ consciousness. Thus, the Big Lion represent an amplifier that gives improbable force to the united consciousness of humanity. At the moment when humanity catches at the tail of the Big Lion, he, in turn, pulls on the leash on the neck of the Little Lion with a crown, and he jumps. The jump of the Little Lion represents an action of incredible power caused by the united with a common goal consciousness of civilization. It is the top of the united consciousness of humanity. The jump informs that as a result of numerous trainings the united consciousness of humanity has reached the highest level and caused the action of incredible power. The Little Lion as a result of jerk on the leash made by the Big Lion, jumps on the handle of the Sword. The Sword represents the laser beam. The jump of the Little Lion shows that the action of the united consciousness of great power can cause the laser beam to destroy the body from the level of the Crystal Structure and the Transition of humanity into the next cycle of life. This is the last phase of the unification of human consciousness, completing the Transition. The sword safely hanging at the side of the Man in the brown dress shows that human consciousness has the ability to cause the laser beam, but in real life it is not required. Thus, the sword exists, but up to this point it has not been claimed. The sword depicted on the left side of the man. This means that in the basis of creation of the united consciousness of civilization of incredible strength has to be love and understanding of all people of the earth. The Little Lion, that makes the jump on the handle of the Sword, pushes by back paws from the kings and Rulers of the world that lost power and the crown. This informs that at the time of the Transition the power will transfer from individual consciousness of the World’ Rulers to the united consciousness of civilization. The Man in brown dress with the Sword. The Brown color of the Man's clothing is the color of Earth - points out that this man represents the people of Earth. The back of the Man that forms a square represents the fourth level of consciousness – the individual human consciousness. Two raised hands are two elongated rectangles. Each elongated rectangle depicts the shift of the brain area on an individual human cell at the unification of consciousness. Two rectangles represent the two people that unite consciousness. In the result is formed a cell of the united consciousness with an extended brain area. This extended brain area represents Man’ back in the brown dress. This way is shown humanity that unites consciousness for the Transition. The cross on the back of the Man. On the back of the Man in the brown dress, that catches the tail of the Lion with both hands, is shown a cross. The cross on the back means that if humanity will stay in individual mode of consciousness, it will be destroyed in global cataclysm of the planet’ destruction. Humanity has to transfer to the mode of the united consciousness and make the Transition to the next cycle of life. Black bandage on the right leg. In the upper of the right leg of the Man in a brown dress, i.e. the main leg is depicted a black bandage in the form of a square. The black bandage indicates that at the present time the main for humanity is individual mode of consciousness, corresponding to the fourth level. However, it will lead to death. This is indicated by black color of the bandage. The Big Lion – symbol of the action of the united consciousness of enormous strength. 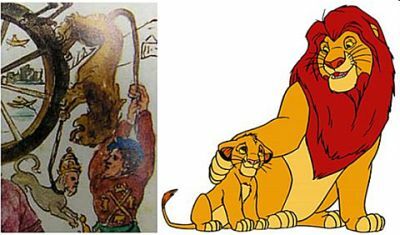 In the right part of the picture immediately after the Black Rooster by clockwise is shown the Big Lion, standing upside down. Lion is the king of beasts, because he has incredible strength. The Lion shows the incredible power of the action of the united consciousness of humanity, capable to destroy the bodies for the Transition to another safe level of the material world. The Big Lion. Lion has huge strength. So, the Big Lion, which the Man of Earth is holding by the tail, depicts required for the Transition incredible amplifying of weak action of the united consciousness of civilization. This amplifying is created by homogeneous-resonant structure of human consciousness as the result of the dissolving boundaries of individual cells of people. The carbon nature of mankind is manifested above all in an incredibly rigid as granite, and very wide borders of individual cells of each human. These boundaries do not allow forming a single cell of the united consciousness of Earth civilization. That's the big problem. Rigid and wide boundaries of the people' cells are manifested in deep selfishness and hard-heartedness of Earth civilization. However, just in this is hidden the incredible danger of the failed Transition. That is why the warning is presented in the form of a number of the Beast 666. It warns humanity that does not understand anything about this danger for the Transition, which must be overcome by lighting the fire of universal love in the hearts! The tail of the Big Lion, as a lever of the Transition into the next cycle of life. The Man in a brown dress with both hands and with all strength clutched for the lowered tail of the Big Lion. The jerk of the tail up – and the incredible strength of the lion can throw the Man into the blue sky, that is, on the Highest level of the material world in the next cycle of life. This is shown by blue color of the Man’ hair. 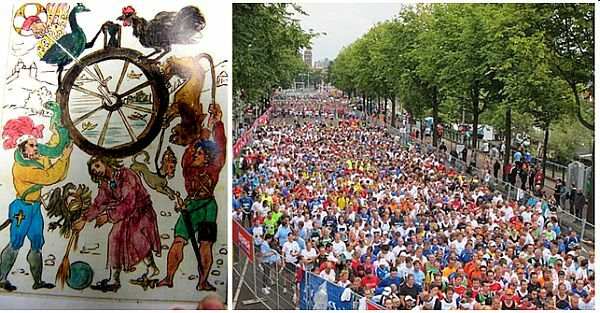 Because the Man in the brown dress depicts humanity, this part of the picture informs the following. United consciousness of Earth’ civilization has to cause an action of incredible strength. This is necessary in order to make the Transition of humanity to another the Highest level of the material world. Blue color of hair of the Man in brown dress. The Highest level on which mankind has to make the Transition shows the blue color of the hair of the Man of Earth in brown dress. For the Transition on the Highest level it is necessary to destroy the body at the level of the Crystal structure by the laser beam – the result of the action of incredible force caused by the united consciousness of humanity. The laser beam shows the Sword, unclaimed in everyday life and, therefore, quietly hanging on the side of the Man of Earth. The action, which will cause the united consciousness of humanity, is shown by the jump of the Little Lion with the Crown, on the hilt of the Sword. However, only the Big Lion can allow making this jump, because in his paws is the leash from the collar of the Little Lion. On the head of the Man in brown dress are shown two layers of different colors – the upper part of brown hair is covered by blue. So is shown two types of people whose consciousness has different action – strong and weak. Brown color of hair represents usual-average Earth people with middle and weak action of the united consciousness. The blue color on the Man’ hair depicts people of the highest consciousness that can cause the laser beam necessary for the body destruction and the Transition into the next cycle of life. These people have dedicated their lives to improving consciousness, preparing themselves for the great service by a strict life – prayers and fasting. However, quantity of these people on the planet is small. It is the top of human consciousness on the planet. Only such people can cause the laser beam. People with strong action of the united consciousness have to cause multiple laser beams at the moment of unification of consciousness of civilization. However action of each of these beams will be very weak and not sufficient for a body' destruction. The main part of humanity has to create homogeneous resonant medium of consciousness, in which actions of separate laser beams will be added and multiply increased. As a result will arise a single laser beam with incredible force of action, which will cover the whole united cell of the Earth civilization and will destroy body. At the same moment humanity will reappear on the Highest level of the material world, where the General resurrection will happen. In order to cause the laser beam of incredible power is necessary that all people of Earth simultaneously united consciousness, forming a homogeneous-resonant structure of consciousness. Has no action: consciousness of children, because the structure of their cell is not formed yet. In addition, on the planet there are many mentally disabled people, whose consciousness does not have action. There are also other categories of people whose consciousness also has no action. Thus, the Big Lion allows the Little Lion to light the fire of the Victory of the Transition! Two hands and one tail. The Man in brown dress grabbed the Lion's tail with both hands. Two hands represent the united consciousness of two people. In addition, each hand has five fingers. Number five means the fifth level of consciousness – the united consciousness of humanity. Ten fingers of the Man' hands are united by a long tail. It also means the unification of human consciousness with a common goal. Two beards in crescent’ shape. Two beards in crescent' shape. Located near each other two beards in crescent' shape – the Man with blue hair and Little Lion tell about unification of consciousness for the Transition. Little Lion with high crown on the head – is the pictogram, which contains numerous symbols of consciousness. The symbols of face, body and crown disclose information transmitted by this image. The Body. Little Lion's tail, as well as the front and back of his body depict three crescents of the united consciousness. The front part also includes two elongated forelegs, which complement the information about unification of consciousness. They inform that the united consciousness is formed by two people with the shift of the cell’ brain area. The head of the Little Lion contains several different symbols of the united consciousness. The elongated head of the Little Lion with a crown forms a pointed oval of dematerialization and the Transition. So, deep association of consciousness of all people of Earth with common goal will cause the Transition. The crown and the small circle at the top. Small circle at the top of the crown represents a small brain area of the cell of individual consciousness. The bell-shape of the Crown represents the expansion of the brain area of the united cell under unification of consciousness of more and more people. Thus, the head of Little Lion with the crown informs about the necessity to transfer from individual consciousness of human being to the united consciousness of civilization in order to form a pointed oval of dematerialization and the Transition. Decorations of the crown in the form of semi-ovals located by the perimeter of its wide part repeat the shape of the pointed oval of the Transition. King with a torn off Lion’ tail in his hand. All obstacles to the Transition will be destroyed from the Above. All obstacles on the way to the unification of human consciousness for the Transition to the next cycle of life will be destroyed by hand from above. This information transmitted by the dethroned King, who lost the crown and power. He is depicted in hastily thrown robe and slippers falling down. In the hand of the King, as the cause of his distress, is shown a torn piece of the tail of the Big Lion with a brush - the most important attribute of the Transition. Not understanding the whole tragedy of his situation – to be destroyed by global cataclysms together with all people of the planet, the King has decided to thwart the plan of the Transition given from the Above. He torn off the end of the tail with a brush in order to the hand of humanity of Earth did not have the abutment-brush and slid off from the tail at the culmination moment of a super-strong jerk. This moment has to be marked by the flash of super strong laser beam, created by the united consciousness of Earth civilization. This moment is the beginning of the Transition of civilization of Earth to the next cycle of life – the crown of human consciousness, its highest point, meaning the final creation of a homogeneous-resonant structure of the united consciousness. The King was punished for his actions that are contrary to the decision from the Above, as a result, he was left with nothing – crown fell off, and the power went off... Now at the feet of the King is emptiness – the inflated by air the big blue ball. This is a warning to the powerful people, to get them to think about the decisions concerning the Transition. Moreover, the picture shows that the Governments of the world have to help humanity to form the unified consciousness for the Transition. Dark red color of the clothing of the former King means the lost contact with the Information world. This connection has been lost due to the power of private property that was stronger than the guidance from the Above - to provide active help to mankind in the Transition in the new cycle of life. Rather than support the Transition of humanity to the Highest level of the material world, on the contrary, the former King pulled out a major opportunity to make it, that is, he deprived civilization the opportunity to continue life. This information is shown by a large piece of the tail of Big Lion with a tassel on the end. This piece of the tail is clamped in the right hand of the King, because just this hand has the highest force of action and potency. Former King tore off a huge and the most comfortable a piece of the tail with a brush, in order to hold it in hand. Humanity now, as shown in the picture, is remained only a stub of a tail, devoid of support-brushes, and hands at any moment can slip. Then the Transition of humanity will be impossible. 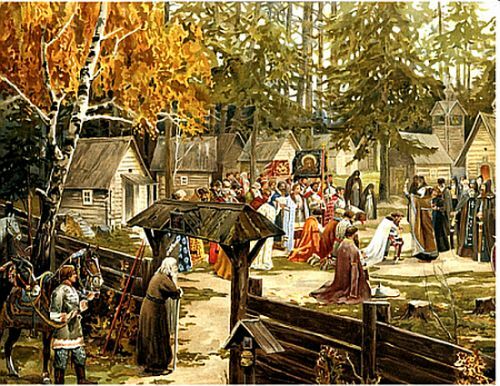 Rejection of his mission turns the King in that poor position depicted in the picture. The former King actually is destroyed and does not have the same power. From the King fall down the Crown and the Eagle – the symbols of royal power. The King wanted to derail the plan of the Transition for continuation of human life, given from the Above. He had the power and the Crown, but now at his feet is emptiness, which is shown by a big blue balloon, inflated with air. The King was left with nothing. A piece of cloth on the chest of the same blue color as the balloon shows that inside he has the same emptiness. Swords hanging on the left side of the Man in brown dress and the Indian, inform about the laser beam, which will cause the united consciousness of civilization for the Transition. The location of the swords on the left side means love at the basis of the Transition. Both swords in the picture of the Man in brown dress, and Indian are placed on the left side of the body where heart is, which is associated with love. The sword placed at the left side, leading to the heart informs. The laser beam can cause only the action of the united consciousness of incredible power, based on love and understanding of people who are aware that they have a common destiny, and only from their joint efforts will depend their common future. The revolution of consciousness. Inverted upside down the Big Lion shows that humanity has to fundamentally overturn consciousness. As a result, the individual mode of consciousness should switch to the mode of unified consciousness of humanity, and the hate – on the love. Since only love, according to the golden rule of morality – love your neighbor as yourself – can melt rigid boundaries of individual cells of carbon nature of mankind to create the united cell of humanity. This is the basis of the Transition. To form united cell of humanity - is the only way to create a huge amplifying of the united consciousness action in order to ignite the incredible power of the laser beam to destroy the body at the level of the Crystal structure, where we now live. This is the only way the General resurrection at the Highest level of the material world in the new cycle of life. The inverted cross of St. Peter. This overturn of the Big Lion is similar to inverted cross of St. Peter that made the decision to be crucified upside down. This unusual decision, as a fact, has passed through the millennia, but has not been understood. The turn upside down means the revolution of human consciousness for the Transition. As it turned out, for the Transition humanity has to change the mode of consciousness and change the individual consciousness of war and hate to united consciousness of love and understanding. Inside segments of the Wheels is disclosed information about the five levels of consciousness developing in the universe. Inside the Wheels are shown five images. However, they are grouped in a certain way. 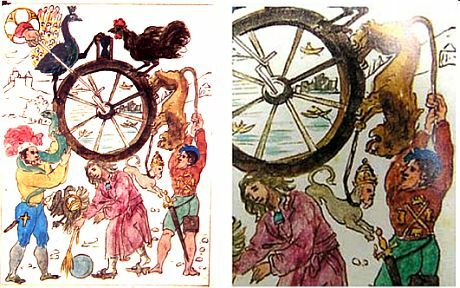 Thus, on the right side of the Wheel the first three images, beginning from the paws of the Black Rooster, are shown one after another. Next, clockwise, show two pictures. However, they are placed not together, but through the free segments. Thus, there are shown five pictures. So is shown the fifth, the highest level of consciousness – the united consciousness of humanity. Expanding shape of eight segments also emphasizes this information – the Transition from the individual consciousness to the united. The classification of the levels of consciousness. In the segments are presented the classification of levels of consciousness developing in the universe. As it was noted, in the universe are developing five levels of consciousness. In the first segment In the first segment under the Black Rooster is displayed a five-pointed star. This is the first level of consciousness of inorganic nature of stars. In the center is depicted a yellow crescent - the symbol of the united consciousness. In the second segment, the next clockwise from the first, are shown numerous homes. The stone houses are the demonstration of the second level of consciousness of inorganic nature of the planet – it's the crystals, minerals. In the third segment, under the stone houses is depicted the symbol which is pointing to the wooden rim of the Wheel. So is shown the third level of consciousness of organic nature of plants and animals. In the center is shown a crescent, split in half and lines which point to the wooden rim. So is marked the third level of consciousness of organic nature. Three previous levels of consciousness. Three segments with depicted figures are shown one after the other without separation. They are separated from the fourth segment by the empty segment without images. So is shown the three previous levels of consciousness entering in the individual human consciousness. In the fourth segment is shown an image of a man in a boat. Thus is demonstrated the fourth level of consciousness of a human being. The fourth segment is separated from the three previous and subsequent by empty segments. The level of human consciousness is separate and independent, and the previous levels of consciousness enter in his individual cell. The fifth segment represents the fifth level of consciousness - the united consciousness of humanity and separated from both sides by empty segments. In this segment are presented the Laws of the united consciousness, as well as the information about the expansion of the area of the brain under the change the individual mode of consciousness on the united. Also is shown that at the unification of consciousness happens the shift of the brain area from the center to the cell boundary. The fifth level of consciousness - the united consciousness is fundamentally different from all previous ones, because it allows causing the action in the material world, which, in particular, allows transforming the body to move through parallel worlds of the material world. The destruction of the body allows you to make the Transition. Conclusion. The picture shows that, along with information about the beginning of global cataclysms, meaning mortal danger, humanity will receive from the Above the Instructions for the Transition, as the only way out for the continuation of life. This is the content of the main picture of Nostradamus from the eight drawings, depicting the Wheel of Time, because it is depicted in the center. The picture in compressed form reveals the events of early disasters on the planet and warns of mortal danger, which lies in wait for humanity in process of creating of the united consciousness. In all other pictures the Wheel of Time is located of the top, so they transmit information which supplements and clarifies the information of the main picture. The central image of the Lion-amplifier repeated by Nostradamus in three pictures in various poses, representing three stages of development of the laser beam for the Transition, indicates incredible importance of strengthening of the action of the united consciousness with homogeneous-resonant structure of consciousness of civilization. It is the most important stage of the Transition to the safe Highest level of the material world and the only opportunity to ignite the laser beam for a body’ destruction. Laser beam ignited by consciousness of Earth civilization based on universal love, will allow humanity to fly up, like a Bird on the Highest level for continuation of life. All information in the pictures is represented by symbols of consciousness. Let’s consider three Nostradamus’ drawing, depicting Lion-amplifier of the action of the united consciousness of civilization, as the central figure. Various poses of the Lion depict readiness of mankind to the ignition of the laser beam. Lion – is the king of beasts, possessing enormous power. That is why the image of the Lion in all of the pictures – is a symbol of the incredible strengthening of the united consciousness of humanity with homogeneous-resonant structure of consciousness. This is a fundamental condition for the Transition. Three poses of the Lion – lying, jumping and walking, in which he is depicted in the pictures – represent three stages of creation of the laser beam. Lying Leo reveals the causes and circumstances of humanity's Transition to another safe Highest level of the material world, where it will become immortal. Presents the Principle of the united consciousness, which lies at the basis of the Transition and a body’ transformation. Jumping Lion with the Sword represents the moment of flash of the laser beam. Walking Lion, having fulfilled the great mission, with proudly raised head in a huge golden circle of glow of a laser beam, represents triumphal victory of mankind’ Transition. Thus, the picture of the Walking Lion reflects events of the Transition by the moment later than the Jumping Lion. Lion in a jump ignited the laser beam, and already achieved improbable success and with proudly highly raised head the Walking Lion makes a circle of honor in the triumphal procession of the Victory of human consciousness. Thus, the image of the Lion pays special attention of mankind of the necessity of incredible strengthening of action of the united consciousness of civilization, as the only opportunity to cause the laser beam for a body’ transformation and the Transition. Lion – an incredible strengthening of homogeneous-resonant medium of the united consciousness of humanity shown by sheep. Sun– the united cell civilization. Sword– the laser beam. Bird – the Transition. A set of parallel lines connecting the bird's paws with water in a bowl and departing to the right means the parallel worlds of the material world. Large golden circle – the flash of a laser beam. Water– depicts habitat change during the transition to the next level of the material world. Fountain – represents change of mode of human consciousness from individual on the united. Summary. Coming global cataclysms of incredible power, caused by processes on the Sun, will destroy humanity. Only the Transition to other the Highest level of the material world can save life of humanity. For the Transition it is necessary to destroy bodies by means of the laser beam caused by action of the united consciousness of civilization of improbable force, which will flash as the Sun. At the same moment the General resurrection will occur, and the renovated mankind will arise again on the Highest level of the material world with holographic bodies. The picture emphasizes that the laser beam will arise only as a result of huge strengthening of the united consciousness of humanity, created by its homogeneous-resonant structure. Sun – the cause of cataclysms. The picture with the lying Leo indicates the Sun, as ttext-align: left;strongstrongspan style=he cause of the beginning of global cataclysms of incredible strength that will force humanity to make the Transition to another level of the material world in the next cycle of life. Study of sunny climate today, as note scientists, shows a significant decrease in solar activity, of about a half of the current. As a result the temperature of the Earth' surface much lowered. However, more importantly, in the periods of low solar activity were observed frequent and more intense volcanic eruptions, floods and other natural disasters. Thus, the sun now came in the phase of decrease of solar activity, which leads to reduction of force of the Sun magnetic field. According to experts, the peak of solar cycle 24 was in May 2013. «The sun is behaving erratically and very interesting» - NASA scientists said. Scientist Pesnell states: «The Sun is behaving unpredictably and very interesting. Throughout our career was not observed anything like such Sun behavior, so far. The solar minimum is too long, it stepped over the date we predicted in 2007. So, let’s prolong the Sun observation and highlight in our diary May 2013. Only use a pencil, please, because the sun and life are unpredictable.» But let's return to deciphering of the picture. Two types of rays – information pair. In the picture Nostradamus showed two types of rays emanating from the Sun. One of them – wavy – reminds a curved body of a snake – the symbol of cataclysms. Another type of rays – as straight lines – reminds an edge of a sword and represents the laser beam, caused by united consciousness of a civilization. These two types of rays are Information pair; by repeating seven times, they form the Sun's disk. Number seven indicates the seventh planet of the solar system – the Earth. One of the wavy lines representing cataclysms passes into the Lion's mane that lies on the ground. It emphasizes that just cataclysms will force people of Earth to make the Transition into the next cycle of life. The Lion – the amplifier of the action of the united consciousness. In the center of the picture is shown the Lion lying on the ground – the king of beasts, possessing enormous force. Lion represents incredible strengthening of the action of the united consciousness of civilization as a result of creating homogeneous resonant structure of consciousness. The tip of the Leo’ tail encircles one of the direct rays of the Sun, as if indicating that only thanks to the Lion was created this laser beam of incredible power. The basis of the laser beam of the united consciousness of civilization are individual laser beams, which cause the righteous and the miracle workers – the people of the highest consciousness, who devoted their lives to prayer. It is known that the moral wealth of civilization is estimated by affairs for the common good, as well as people who brought the greatest number of good in their communities. With these people fused moral sense of every nation - they are its nutritious soil and its roots. These small laser beams has to be strengthened by homogeneous resonance structure of consciousness of civilization depicted by the Lion, for receiving the laser beam of incredible power. This is the great mission of the Lion in the Transition of humanity. Shown in the figure lying Lion so far nothing strengthens, but is ready to perform its mission. The Cap on the head of the Lion plays a dual role. On the one hand, the red color of the Cap indicates that the Lion-amplifier – is not a material object, but analog of transformation that will take place in the Information world at the synchronous unification of consciousness of civilization with a common goal. On the other hand, the shape of the Cap represents the Principle of the united consciousness. Examples in the complexes. Required for the Transition the laser beam of incredible power is shown in various complexes of extraterrestrial civilizations. Thus, in Mexican complex Hochikalka it is shown in the form of a stream of light of incredible power that passes through a hole in the roof at the zenith of the sun. Incredible strengthening that is necessary for creation with the help of homogeneous-resonance structure of consciousness also is shown in various complexes of extraterrestrial civilizations – it is the Great Sphinx, the Avenue of the Sphinxes in Egypt and others. Wide border of a cell – a weak action. Synchronous unification of consciousness of civilization will cause an action, which has to destroy bodies of people of Earth on the level of the Crystal structures. However, each individual cell includes three previous levels of consciousness. In addition, carbon-based life on the planet creates a wide border of each individual human cell. Therefore, the action, caused by the united consciousness of all civilization, will be too weak and insufficient for transformation of the whole this system. That is why arises and three times repeated the image of the Lion in the pictures of Nostradamus, as a call: People of the Earth! It is extremely important to gain huge strengthening of very weak action of the united consciousness! Image of the Sun – the cell of the united consciousness of humanity. The brain’ area in the cell of the united consciousness is expanded due to merging of two or more brain’ areas of cells for information exchange. Solar disk with a thin ring and a human's face inside represents the cell of the united consciousness of humanity with an extended brain’ area. Wavy ray consists of increasing to the Solar disk wavy lines, like zigzags. In the symbolism of consciousness this means the unification of consciousness of more number of people for the Transition up to the formation of the cell of the united consciousness of humanity, which shows the solar disk with a human face. Hook-crescent at the end of the ray. Each wavy ray, as well as the tail of the serpent, ends by a hook image. This way is shown the crescent of the united consciousness that occurs as a result of the shift of the brain areas at uniting of consciousness of two or more people. The Wheel of Time of white color at the top of the picture shows the transparency. This way are shown holographic bodies that will have people in the new cycle of life, but not solid, as it is now at the level of the Crystal structures. Holographic bodies will be of huge sizes compared to ours. This effect of the expansion is shown in several pictures of Nostradamus, where he informs about the Transition on the Highest level of the material world and the General resurrection. Here is one of them, the picture 30. A short man represents humanity at the level of Crystal structures before the Transition, and sitting man of huge height depicts the civilization of Earth at the Highest level. As information about the Highest level: on the seated man, almost naked, is thrown over a fabric of blue color, and both men wore wreaths, representing expanded brain’ areas of the cells of the united consciousness. Spokes of the Wheel are arranged in two groups – two spokes at the top and five spokes below that are underlined by upper and lower ornaments on the Wheel’ rim. Number five means the united consciousness, and the number two indicate the Principle of united consciousness. Besides, the ornament is shown near two spokes at the top and two spokes at the bottom. This also emphasizes the Principle of united consciousness. The Information Tape as well as the Wheel of Time has white color, which represents transparency. Besides, it has five folds – three on one side and two – on the other. According to the digital symbols of consciousness the number five means the fifth level of consciousness – the united. The number three reports that a cell of the individual human consciousness includes three previous levels of consciousness. The number two shows the Principle of united consciousness. The ends of the Tape bent into crescents of the united consciousness. In addition, the folds of the Tape are opened down. This means that on the picture is represented single massive of information. Thus, the folds and colorless of the Information Tape tells that people of the world have formed the united consciousness and made the Transition into the next cycle of life. Three merged semi-ovals. Under each of the ends of the Tape is shows a small element – under the left – a six-pointed star, and under the right – three merged semi-ovals. Location of the three merged semi-ovals – two below and one – at the top, as well as small black dots, shown in the center of each semi-oval, represent the Principle of the united consciousness, which causes an action for the Transition. The six-pointed star is represented in the form of two intersecting lines that form a cross, which from top to bottom and left to right crosses the third, wider contour line. So is shown that for the Transition is necessary to destroy a body of a human of the fourth level of consciousness. On the other hand, the number six indicates on carbon basis of human life, which is revealed in wide border of human cell and, as a result, in weak action of the united consciousness. Thus, the picture at the same time warns about mortal danger of occurrence of global cataclysms, and also indicates the way out for continuation of human life – through Transition of humanity into the new cycle of life with the help of the united consciousness. Summary. Laser beam ignited by consciousness of Earth civilization based on universal love, will allow humanity as a Bird to fly on the Highest level for continuation of life. The Sword – the laser beam. The central figure on the picture is jumping Lion with the Sword in the left three-toed paw. The Sword represents the laser beam caused by the united consciousness of civilization for a body’ destruction. This is the only way to make the Transition on secure Highest level of the material world. Thus, the picture highlights that just the Lion-amplifier is the basis for creation of the laser beam of the united consciousness of humanity for the Transition. Sheep represent the civilization of Earth that has united consciousness. The jump of the Lion means that everything is ready to the flash of the laser beam. Humanity, that represents a group of sheep, had already united consciousness and created in it homogeneous-resonant structure. Sheep represent the civilization of Earth that has united consciousness. Why? Individual cell of a human being. Unification of consciousness is presented on the picture by the location of all the sheep by two – all together are shown four pairs of sheep. Only to the right on the background Nostradamus shows three sheep standing as a fan – tails together and heads in different directions (blue arrows). These three sheep represent three previous levels of consciousness included in a human cell of the fourth level of consciousness. Thus, the number four means the fourth level of consciousness corresponding to a human being, and the number three – three previous levels of consciousness included in human cell. That's why sheep represent the civilization of Earth, not only having united consciousness, but also formed its homogeneous-resonant structure necessary to strengthen arisen action in the form of the laser beam. The Lion's body consists of many symbols of consciousness – crescents of the united consciousness, brain areas of cells of individual and united consciousness that reveal the Principle of the united consciousness – the basis of the Transition. Love and mutual understanding – the basis of the Transition. At the heart of the unification of consciousness of civilization lies well-known principle «Love thy neighbor as thyself.» This is indicated by the double bend of the tail of the Lion in the form of two crescents of the united consciousness, as well as double-bend of the back of the Lion, representing the Principle of the unification of consciousness. Moreover, in the center of the united cell with the expanded brain area on the back of Leo is depicted the Latin cross, or the cross of Jesus Christ, the main commandment of whom is the basis of the Transition. Thus, Nostradamus highlighted that just this commandment has to unite consciousness of people of Earth for the Transition. Latin cross, pictured on the back of the Leo, also known as the Long cross, the cross of the Crucifixion, the Cross of Life, the cross of Suffering – is a four-final cross, which vertical crossbar is longer than horizontal, and is located above the middle of the vertical and split it in half. This cross lies in the basis of the Supreme Order of Christ – it is the Order of the Vatican, awarded by the Pope. This is the highest papal award which consists of the Badge of the Order and star of the Order. Badge of the Order as a white Latin cross with red enamel, topped by golden crown and is worn on a chain. Thus, in the center of expanded brain’ area of the cell of the united consciousness of civilization is shown the cross of Jesus Christ with the main commandment «Love the neighbor as yourself», that is the basis of the Transition. Two-toed right paw of the Lionrepresents association of consciousness of two people – the basic principle of the Transition. Thus, the top and bottom upper and lower claws represent shifts of brain areas in each cell at consciousness association. Three-toed left paw, which clamps the Sword. The same principle «Love thy neighbor as thyself» repeats the left paw, going from the side of the heart, in which is clamped the Sword – the laser beam. This element of the picture informs that the laser beam can cause only love and mutual understanding of all people of Earth, coming from the heart. Only love will destroy wide borders of the cells of people of Earth with carbon base, which make humanity hardhearted. Picture 52. Love at the heart of the Transition. The information, that in the basis of the Transition has to be love, vividly tells also another picture of Nostradamus. In this picture, the Heart, flying by air like a banner, sending information to all people of Earth, is surrounded by five elements of the Transition. This is a heraldic lily in French – fleur-de-lis, literally – flower lily, which is often used in Nostradamus pictures. This entire symbol consists of symbols of consciousness – on the side – two crescents of the united consciousness; in the center is the rhombus, which reveals level of consciousness of uniting people – the fourth; and at the bottom is threefold element informing that each cell of individual human consciousness includes three previous levels of consciousness. Symbols of the Transition resemble birds. There are five of them. This way is marked the fifth level of consciousness – united. Shown on the right Golden ring depicts the expanded brain area of the united cell and informs, that Earth civilization has united consciousness. However, this picture also warns that the information about the necessity of the Transition, its basic principles and conditions spread too slowly, as a Turtle. The Bow on the handle of the Sword. Near three-toed paw of the Lion in front of the blade of the Sword is depicted a figure resembling a double-sided bow or two connected trapezoids and diverging to opposite sides. This way is shown the expansion of the brain’ areas at associating of two people’ consciousness. Thus, a small brain area of the cell of individual consciousness is shown by a circle in the center, and the expanded brain area of the united cell is shown, on the one hand, by huge middle finger of the Lion’ paw. On the other hand, the brain areas of the united cells are marked by bilateral expansions. Two individual cells on the head of the Lion, next to the ear. On the head of the Lion, near the ear, are shown two individual cells, with small brain’ areas that represent the Principle of the united consciousness. Thus, the ear represents a horn of the crescent of the united consciousness. These two cells near the ear means that humanity heard the call from the Above of the necessity to unite consciousness for the Transition, and the Lion fulfills this instruction. Three flowers coming out of the mouth of the Lion represent three levels of consciousness included in the human cell, and the mouth of the Lion depicts the crescent of the united consciousness. Petals of each of three flowers also remind the symbol of the Transition – heraldic lily. Each flower consists of two crescents of the united consciousness which are placed at the sides. So are shown two pairs of people that unite consciousness – one pair of people represents one crescent and a second pair – the second crescent. The central part of the flower, directed up – is shown as extended rhombus of four-sides, which indicates the fourth level of consciousness of people that unite consciousness. Sometimes in this place is represented a pointed oval – the symbol of dematerialization and the Transition. At the base of each flower is depicted the expanded area of the brain of the united cell, which was formed through the unification of consciousness of four people. The flying up Bird of the Transition near the Sword. The Sword represents the laser beam, and the Bird depicts the Transition of humanity to another Highest level of the material world into the new cycle of life. This part of the picture tells that the laser beam ignited by the Earth civilization based on universal love, will allow humanity as the Bird to fly through parallel worlds and to reach its Highest level for the continuation of life. Parallel worlds of the material world depict numerous parallel lines – vertical, like a stream of water flowing into the Bowl from the tail of the Bird, and at an angle off, going to the right. Parallel lines go to the right, as it is considered that the right side is associated with the greatest action. So is shown the Transition of Earth mankind to the Highest level of the material world. The takeoff of the Bird of the Transition shows that Transition has begun, and humanity will already reach the Highest level and continue life in the new cycle, where will become immortal. The shape of the bird's body is entirely composed of symbols of consciousness. The head of the Bird and a semicircle above it depict the extended area of the brain of the cell at unification of consciousness. Two small eyes and a large semi-circle, connecting them, as well as the beak of the Bird, reveal the Principle of the united consciousness. The Tail of the Bird depicts the expansion of the brain areas of two uniting cells, which form the belly of the Bird in the form of a large circle representing the extended area of the brain of the united cell. The left wing of the Bird from the top, which consists of two bends, represents two uniting cells, i.e. two people, and three lateral feathers indicate the three previous levels of consciousness, entering into every human cell. The right wing of the Bird, which includes two lateral feathers and a large semi-circle of the upper part of the wing, reveals the Principle of the united consciousness. The Change of humanity habitat. The water in the Bowl represents the change of habitat for humanity on another, the Highest level of parallel worlds where humanity will have another state of body. About new holographic body of humanity on the Highest level informs the transparent Wheel of Time in the upper part of the Picture 66. The lying Lion. The Bowl with water. Bowl shape depicts the mode change of human consciousness from the individual to the united. The cell of individual consciousness represents the base of the Bowl. In this case, a small area of the brain of the cell represents the basis of the Bowl' leg. Extension of the Bowl' leg upward depicts the gradual expansion of the area of a brain up to the huge size of the area of the brain of the united cell of Earth civilization, which is presented by the extended upper part of the Bowl with water. Small circles in the form of ornaments, following one after the other on the side of the bowl, represent a small area of a brain of individual cells of people that are forming the extended area of the brain of the united cell of civilization. Summary. 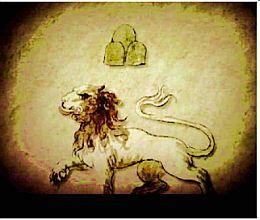 The picture with the walking Lion in a large gold circle, depicting shining of a laser beam, is shown the moment of the Transition of civilization on a secure Highest level of the material world. This means that mankind has already used the information about the necessity to strengthen the incredible action of the united consciousness, and lit the laser beam, which by the brightness reminds the sun, for a body’ destruction and the Transition into the next cycle of life. Large circle of golden glow. The walking Lion is presented inside the large circle of golden glow that depicts the cell of the united consciousness of humanity, which is covered by of the laser beam of a huge brightness as the sun. So is shown incredible strength of the action of the united consciousness of humanity, created by homogeneous- resonant structure of consciousness. Right part of the big circle, in which is depicted the walking Lion, is shown as a square, representing the fourth level of human consciousness, and the left side – in the form of a circle. So is shown the change of individual regime of consciousness to the united mode of consciousness. The direction of motion of the Lion – right to left – emphasizes this transformation of consciousness – from the lower fourth level of consciousness to the highest – the fifth. Three semi-ovals. Inside the circle in the form of three united semi-ovals are shown three previous levels of consciousness entering into the individual human cell – these are levels of inorganic and organic nature. On the other hand, so is presented the Principle of the united consciousness, through which mankind can make the Transition to a safe level of the material world to save life. Similar three semi-ovals are represented also in the upper part of the Picture 66. The Lying Lion. However, in each of semi-ovals of that pattern (shown in gray) is marked the area of the brain in the center. So is designated each of the three previous levels of consciousness entering into the individual human cell. In the considered Picture 42. The Walking Lion three semi-ovals are shown without the brain areas. They are homogeneous with a cell of the united consciousness of civilization, covered by the laser beam, and are included into it, as constituting of the general Transition. The body of the walking Lion is composed of numerous elements of symbolism of consciousness. Thus, the forked tip of the tail shows two cells to be merged, and the tail is composed of two crescents – small and large. The tongue is made up of two connected crescents united consciousness. Three bending on the back – two small and one large – portrayed the Principle of the united consciousness. Many of the drawings of Nostradamus inform about the necessity to cause the laser beam of the incredible power by the united consciousness of humanity for salvation from global cataclysms of the planet' destruction. Among them is the Lion, walking in the huge golden circle, depicting the glow of the laser beam as the victory of the Transition. The laser beam ignited by Earth civilization on the base of universal love, will allow humanity as a Bird to take off and through parallel worlds to reach the Highest level for continuation of life.